One of the or perhaps the most daunting aspect of using a PC is being tied down to your work desk by a bunch of wires. However, a couple of these cables such as power and monitor cables are essential to the functioning of the desktop components, and can be neatly tucked away with twist ties. But adding more wires to the mix by connecting other important computer peripherals such as a mouse and keyboard can quickly turn your workspace into a cluttered configuration. “Wireless” computer peripherals, just like the word suggests allow you to perform daily computing tasks without the extra spaghetti, and from a farther distance away from your PC or laptop. When shopping for the best wire-free computer accessories, Anker is a name that tends to crop up often, and there’s good reason for it. Conceived in July, 2011, Anker is regarded as one of the market leaders in the charging and smart device space, and boasts an extensive lineup of innovative devices, such as the AK-A7733111 wireless mouse and keyboard. For wireless computer accessories that offer unmatched performance, the wireless keyboard and mouse combo by Anker is truly hard to beat owing to several reasons. For starters, they connect via an industry-leading 2.4 GHz signal, which allows you to work interference free and up to 26 feet away from your computer. Both devices included in this combo boast a compact and lightweight profile, and are ergonomically designed for enhanced comfort when working across longer periods. the keyboard and mouse in this wireless computer peripheral set are easy to setup by simply plugging in the included nano receiver into one of the available USB ports on your PC. What sets the two Anker wireless devices apart from the competition is their long battery life, which clocks in at a whopping 3 months on a single charge. 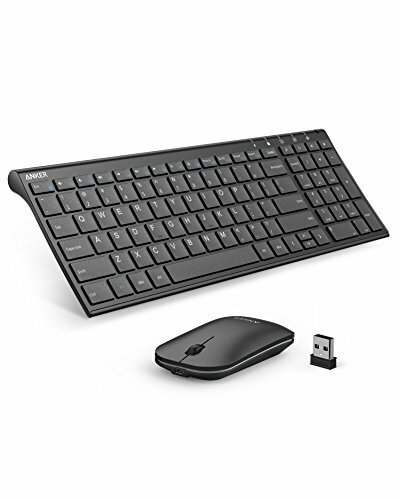 Compatible with most Windows operating systems including the latest Windows 10, this Anker wireless keyboard and mouse set comes with everything you need to get started right out of the box including a charging USB cable and keyboard protector. The Anker wireless keyboard and mouse are a perfect fit both novice and expert computer users or simply those who’d like nothing but top-notch computer accessories without breaking the bank. Given their sleek and compact footprint, they can be easily tucked away in a bag and transported on your daily commute, and can even be charged on the go by simply connecting them to a USB power source such as a laptop. Unlike most computer accessories in its segment, the wireless mouse and keyboard combo by Anker offers a rather long 26-ft. connectivity distance, giving you the freedom to work from literally all corners of a medium- to large-size room. If you tend to work on the computer for longer periods or would like to avoid muscle strain or other similar issues, the Anker mouse and keyboard is a great option for you thanks to their ergonomic design. And to seal the deal, both devices in this set are backed by an impressive 18-month warranty against any manufacturer defects. Both the mouse and keyboard included in this set of computer peripherals by Anker connect to your PC via a 2.4 GHz signal, so you can expect lag-free and uninterrupted performance from as far as 26 feet away. Tipping the scales at just 0.81 lbs. and measuring 14.4 x 4.9 x 0.64, the keyboard and mouse are a joy to take with you on the go and use even in tight spaces. When fully charged, the keyboard and mouse can perform without any hiccups for 2 hours per day or 3 months until the next battery power replenishment. In an effort to save battery power, both the mouse and keyboard with turn off automatically after 10 minutes of inactivity. To wake the devices up, simply tap a key on the keyboard or one of the buttons on the mouse. The Anker Wireless computer peripherals are compatible with several if not all versions of Windows operating systems including Windows XP and Windows 10. The keyboard in the set is appointed with low-profile keys for a comfortable and silent typing experience. The full-size keyboard features an array of function keys, and is equipped with battery status light to indicate when its due for the nest battery power top up. And when it’s time to recharge the devices, plug them into an available USB power source such as a power bank until fully charged. Something that’s not seen often in the computer accessory spaces is an 18-month warranty against any manufacturer defects. The Anker wireless keyboard and mouse combo are perfect computer accessories to make your daily computing tasks a whole lot easier. They come with a long list of features including USB charging, 26 feet working range and 2.4GHz wireless connectivity. However, if you have limited space on your work desk and prefer a mouse and keyboard built into one device, the Logitech K400 Plus Wireless Touch TV Keyboard is an option worth exploring. It features quite keys, 33 feet working range, an integrated touchpad, and is compatible with Windows 7, 8, 10 or later, Android 5.0 or later and Chrome OS. The Anker 2.4 GHz Wireless Keyboard and Mouse Combo comes with all the right features for a comfortable and efficient user experience. They are easy to set up, and powered via a USB cable, allowing you to use and recharge then wherever you go. Both are backed by class-leading 2.4 GHz connectivity for a lag-free and experience and the ability to use them from as far as 26 feet away from your computer. The icing on the cake is the included 18-month warranty against manufacturer defects, which ensures you won’t be shopping for a wireless mouse and keyboard anytime soon.